I had an epiphany about negative emotions recently as I was walking by some really tall trees (yes, this is relevant! ): Spiritual growth is not about “high vibes” and experiencing only positive emotions all the time, it is becoming able to face the worst negative emotions either through experience, or the knowledge that these dark places hold the deepest lessons. It is the courageous person who can stare into the abyss of one’s own despair, grief, anger, fear, etc., and transmute these to light (basically the whole basis of healing), whereas anyone can deny or suppress negative emotions in the misguided attempt to operate only from the Law of Attraction. 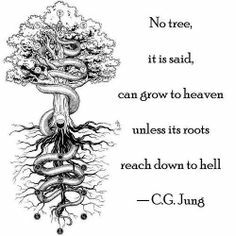 A tree that tries to survive only on sunlight without being willing to “dig deep” into the dark just doesn’t have the foundation to get far. Moving in religious/spiritual circles, it is not unusual to run into people with little objectivity with regards to themselves; they either overestimate their abilities or project all their problems onto others around them, or both. Besides these habits bringing their own problems (and I’ve been there), I suspect these individuals get stuck, with little real progress in their personal or spiritual lives. (I follow Jeff Brown on FaceBook and love how he calls people who deny negative emotions and/or deny their egos the “ungrounded spirituality movement”.) The most difficult part of my life was when I had internalised the message (along with others) that negative emotions were bad. The ego was bad. The ego had to be destroyed so that only love, light and generosity were experienced all the time. Instead, life got tougher when I clung to this belief, in my case because I thought I had to be selfless and draw no boundaries at all around my time and my energy. I can laugh typing that now. Whether it’s lack of objectivity, getting stuck, exhausted selflessness, or “idiot compassion” (as my first teacher calls it), I feel these are all stem from the same root problem (plant language flowering in abundance now! ): Being unable or unwilling to embrace that part of ourselves that is vulnerable and susceptible to fear, insecurity, and desire. Yet we do get scared, and angry, and sad, and pissy when tired. I mean, we can’t all be equanimous Buddhas all the time. Who are we kidding? We’re still on this plane. We have stuff to heal! It was no surprise to me after I started processing my exhaustion and grief/anger that I found others struggling with the same negativity-denial–and I shared my realisation with them, to much relief. I ran into Buddhists who felt guilt when they shed tears at the death/deterioration of loved ones, who felt guilt when anguished in difficult situations; who felt guilt and disappointment in themselves, in other words, for not being robots. Ironically they were still facing a negative emotion–guilt–on top of the other stuff. It becomes a big bundle of scary emotions to work through, that could have been managed more easily if accepted and expressed healthily on first occurrence. Not to disparage Buddhism (because some teachers still seem to convey that the ego MUST BE KILLED), it does name three poisons: Ignorance, attachment and aversion. I’ve still found this to be helpful and true, so it is a bit ironic then, to be averse to one’s own ego and feelings–integral parts of oneself and one’s human experience. To deny these is to become un-whole–no wonder progress becomes tough. A plant without roots is in danger of falling at the slightest disturbance. Maybe it’s not just enough to ground; It’s the tree with the deepest roots that prevails and thrives. So instead of aversion to the dark, it’s better to dig deep, integrate and grow from these “dark” experiences. Did you know that the root growth of plants is most active in the night? It seems so very appropriate.